Making the Camelot quilt has been interesting. I know this sounds silly but I really took no notice of the name, it was just a label. I was surprised when I looked at my blocks and they seemed very heraldic. They reminded me of knights at a jousting tournament. It was only when I articulated this that I realised that was very fitting for a quilt called Camelot! I have seen many others of this quilt and all are gorgeous but none reminded me of medieval times. That’s why I was surprised when mine did, especially as I have used modern fabrics. Here’s a photo of the nine completed blocks on what may become the background. I’m actually not sure I like them together. Anyway I’ll wait until I have the other colourways completed. I have to admit that the ones with red in them are my favorites. The others are nice, too, but I like the bold colors! I just love them! And I think that maybe you don’t like them together because the background is too ‘blah’, I’m wondering how they’d look on a colour… A more subdued version of that darker green in the centre perhaps…. It’s hard to tell on the screen. There is quite a variety in those compass blocks. It’ll be interesting to put them together so the bolder ones don’t take over. Blocks are beautiful. 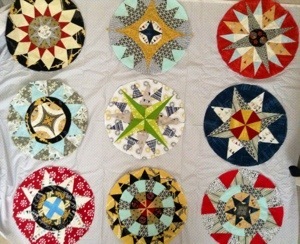 Please post finished quilt, way too pretty not to be admire by all I’m sure. On back ground comment, It depends on how much you want blocks to stand out!